It’s been a while since I posted an interview here, however, it would be a loss if interviews with interesting people only appeared in an issue of a printed magazine and then couldn’t be accessed by future readers (or those who don’t speak Czech and cannot read the XB-1 magazine). No despair! Here is an interview with an amazing writer and editor C. C. Finlay from late May last year, published in the August issue of XB-1. A lot has changed since then, most importantly he has become the editor of F&SF. 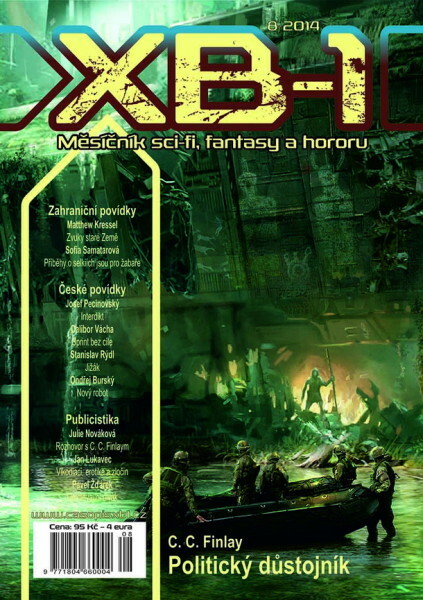 Below is the full interview including the introduction for Czech readers, who could read his novella The Political Officer in the same issue of XB-1. An author of many talents – that’s a fitting description of Charles Coleman Finlay. He has published over forty short works, many of which have been nominated for major awards like Hugo, Sidewise, The Theodore Sturgeon Award or Nebula and reprinted in several Year’s Best anthologies, and four novels. He doesn’t restrict himself to one genre only; his stories represent a broad section of the whole spectrum of speculative fiction. His first novel, The Prodigal Troll, takes an innovative approach to the abandoned child raised in the wilderness trope. Finlay’s excellent storytelling, original depiction of the troll society and the protagonist’s view of human habits and values earned the book a very positive critical reception. His subsequent novels belong to a trilogy Traitor to The Crown, set in the time of The Independence War and centered around a minuteman Proctor Brown, who has the gift of witchcraft. C. C. Finlay also teaches writing at workshops and he’s the guest editor of this year’s July/August issue of The Magazine of Fantasy & Science Fiction. Let’s find out more about the origins of his novella in this issue of XB-1, the experience with editing F&SF, upcoming projects and more. Let us start with The Political Officer. Maxim Nikomedes, the protagonist, is a very intriguing character; he’s certainly not a typical hero and most people would condemn some of his actions and opinions, yet we still sympathise, understand his aims and wish him success. How did you feel about writing this character? Maxim interested me as a character precisely because he was a man who had done many despicable things. All along he thought he was doing them for a good cause, to support a government that he believed in. Yet over time, he’s come to have his doubts. That puts him in a difficult moral position, which was interesting to me. Maxim’s doubts eventually cost him a lot in the sequel The Political Prisoner, published in 2008. You mentioned having an idea for a third Maxim Nikomedes novella in an interview with John Joseph Adams shortly after its publication. Are you still planning on writing it? In both novellas, Max is in a difficult position because some of his former actions have come back to catch up with him. I have about 10,000 words of a third novella written, but the moral problem at the center of the story hasn’t crystallized for me. I need to think more about Max’s past and the past of his world and how that comes to haunt him in the present. I’m also thinking about ways it can all come together into a novel. Once you’ve written three novellas about the same character, you have a book, so I want to make sure there’s an overall arc to his story. Writing the stories over such a long time—more than a decade—makes that more complicated. But he’s still a character that I think about a lot. I’m not done writing his stories. Speaking of Max’s world, his home planet Jesusalem is clinging to a traditional view of humanity, refusing transgenic treatments and other changes of what it means to be a human. What is your own view of post- and transhumanism and do you think we’ll have to deal with a similar fear of change soon? Ohio, where I live in the US, has the largest population of Amish people in the world. The Old Order Amish are a religious group that clings to 16th century technology—you can drive the country roads an hour from my home and see people farming with horse and plows. I see so much fear of change in the world that we live in now, that I wanted to imagine a world where people cling to late 20th century technologies. To them, transhuman means inhuman. I think that the change is inevitable—it’s already happening around us, on a thousand fronts, faster than anyone could stop. And I’m excited about it. But not everyone will feel that way, and so I wanted to write about someone who inherited and is stuck defending a worldview that glamorizes our own period of history. It’s a way of turning the microscope back on us from a distance. In your trilogy Traitor to The Crown and a couple of your short stories, you visited the era of The Independence War. Did you have to deal with things people glamorize today from that epoch? What was the biggest challenge in writing stories set in this particular part of history? One of the things I noticed in graduate school is that people like to compartmentalize different pieces of history. This thing happened over here, and it’s completely separate from this other thing over here. What intrigued me about writing the Traitor to the Crown stories was that the American Revolution started on virtually the same ground as the Salem Witch Trials, and they were only eighty years apart. In fact, the last person killed for witchcraft in America was an old woman killed in Philadelphia after the Revolution, during the period when the states were ratifying the Constitution. So the Revolution is held up, in America at least, as this triumph of rationalism and Enlightenment ideals, and yet it was occurring in a world that overlapped and coexisted with these beliefs in magic. I had never seen anyone talk about that before, and I thought it made a great background for writing this epic fantasy. So much fantasy owes a debt to Tolkien and to European history, and that is great. And I see a lot of writers looking to other, non-Western cultures now as inspiration for their fantasy. But my professional training was in Early American history and American literature, and I saw all these other sources to draw on too. I should add the practical truth of the writer’s life… I had to write those books in a very short period of time. The publisher wanted all three in under a year. It ended up taking me about 18 months. But still the time frame made it easiest to write what I knew, and what I knew was the American Revolution. And there are a lot of early American literary references in there as well—bits I pulled from Nathaniel Hawthorne (Bootzamon, for example) and James Fenimore Cooper. So that made it fun. Do you currently have plans for revisiting any other part of American history? I just published a ghost story about the California Gold Rush in Fantasy & Science Fiction, which came about because I was helping my wife research her new series of Gold Rush books. So yes, I’m sure that I’ll continue to write alternate history and historical fantasy stories. You wrote two stories together with your wife Rae Carson. Are you planning to co-author some longer work someday? We’ve drafted a novel together that I’m polishing now and we’ll send it out this summer. We love writing together. Our skills really complement each other, and even when we’re writing independently, we’re the first reader for each other and read every thing the other one writes. She makes me a better writer and I hope I do the same for her. I should add that it extends even beyond writing… When I was editing the July/August issue of F&SF and got to the last bunch of really great stories, I asked her to read some of them and give me a second opinion so I could discuss them, and the issue with her. We work as a team. I was just going to ask about F&SF; many of your short stories were first published there and this year, you’ve got an opportunity to see the editorial process of the magazine from the other side: You’re the guest editor for the July/August issue. For the first time in the magazine’s history, you opened F&SF for electronic submissions, and received a total of 751 submitted stories. This seems a bit terrifying number, especially since you only had a couple of weeks to go through them, but you managed without slush readers and sent each author a personal response. That’s just awe-inspiring. Are you a secret superhero? Ha! That was pretty much the only thing I did for a month. And I loved it. What was the editor’s experience like? Would you like to try it again in the future? The experience was fantastic. It was the most exciting thing I’ve done since I got my very first stories published. Gordon Van Gelder, the publisher and usual editor for F&SF, and I have already agreed that I’ll do two more issues in 2015. I’ll be announcing the reading period for the first one very soon. That sounds great! By the way, did your experience with teaching at the Online Writing Workshop and Clarion help you as an editor in any way? Yeah. I’ve done a lot of writers workshops over the years—some graduate school MFA classes, local workshops, the Online Writing Workshop/OWW. I’ve taught at Clarion and Alpha Writers and other workshops. I’ve attended Sycamore Hill and Rio Hondo and Blue Heaven. For as long as I’ve been doing it, I’ve seen stories and books that I thought should be published. Things I wanted to put in front of readers and say, “Hey, I think you’ll love this.” This is the first chance I’ve had to do that, and it was a lot of fun. In fact… When I was reading the submissions for F&SF, I saw one story that I recognized right away. It was a story by Ian Tregillis, that he wrote during the week I taught him at Clarion. I loved the story when I read it then. The story didn’t quite nail the ending originally, but Ian has improved so much as a writer since then. I think he’s published 4 novels, with more on the way. Anyway, he had submitted it originally, right after Clarion, and had no luck with it. When he heard I was editing F&SF, he remembered that I loved it, so he pulled it out, completely revised it and nailed the ending and then submitted it to me. I’m really excited that I get to finally see it in print. I’ll be looking forward to it! When you edited F&SF, you couldn’t have picked more stories with a similar topic (like for example time travel). Did you at any point think “I wish I was editing a themed anthology”? Would you like to try it some day? I know I discussed the option of doing a themed issue at one point. I think it was with Gordon. And that could be fun. But that’s not really F&SF. The thing I love about the magazine—and maybe the reason why I was a good fit there as a writer—is it’s incredible diversity. No other SF magazine has a history of publishing such a wide range of stories. And my own interest as a writer—and as a reader—are all over the place. Just in F&SF, I’ve published space opera, hard SF, epic fantasy, sword and sorcery, ghost stories, alternate history, humor. So when I edited the magazine, I really wanted to bring that same diversity to it, both as a reflection of the best part of the magazine’s history and as a reflection of my own interests. I’m publishing thirteen stories in the issue, and all thirteen are by writers who’ve never appeared in F&SF before. That wasn’t my intention when I started, but I’m happy with that result. Your own fiction covers a very broad range of speculative topics and subgenres; you write various kinds of fantasy, science fiction and horror too. What drives you toward each of these genres? My horror stories are always the most personal, even if they don’t seem to be about me at all. It was a long time before I realized that all of them take place in small towns in Ohio, like the one I grew up in. But apart from that I couldn’t identify what drives me to a particular story. I get flooded with new ideas all the time, and I tend to write the characters that stick with me the longest. Sometimes I’ll think about a particular character for years before I put them down on paper. The genesis of Maxim Nikomedes sounds like this case. Yeah, he’s a great example. One of the first things I wrote twenty years, that has never been published, was an unfinished novel about Jesusalem and Maxim Nikomedes as a child and young man. I came back and picked him up as a character much later in his life, when he faced more difficult personal choices, but I used a lot of the world-building from that original story. Is there a chance you’ll come back to it, perhaps when putting the three novellas together for a novel? Yes, definitely. I never really let go of anything, but there a few characters and worlds that spin in my head constantly. Did this happen for example with the character of Maggot/Claye in your first novel, The Prodigal Troll? Maggot was a different case, however. I loved the Tarzan stories growing up, but Tarzan’s experience—to grow up apart from society but to fit in smoothly and completely in any society afterward—didn’t ring true to me. I wanted to write about a damaged character, who grows up apart from people and then doesn’t really understand them. The Prodigal Troll is kind of an anti-Tarzan novel, deconstructing some of those tropes in a way that I found amusing. The sales for that book were so terrible! I had started another Maggot novel, but when it became clear that there was no market for the book, I took the biggest chunk of it and published it as a novella in F&SF called “Abandon the Ruins“. People seemed to like that well enough, and it was translated into Russian, my only story to appear in Esli. Something similar happened with the Traitor to the Crown books. Sales were terrible. I had a big chunk of another novel written in the series. In the end, I published another story in that world in one of John Joseph Adams’ anthologies. Although those are characters I will probably visit again some day. Can you tell us what you’re currently working on and give us a hint what is the novel written together with Rae about? Editing F&SF is my biggest current project and I’m excited for that to come out soon! On the fiction side, I am currently working on a longer SF story set in the universe of Maxim Nikomedes, but he only appears in it briefly as a minor character. It’s a story about a Greenland-type world—someplace marginally habitable out on the edge of civilization, and a character who leaves and then decides to go back home. The novel with Rae is a contemporary SF Young Adult novel, and it’s a lot of fun.